The rallying cry of The Canadian Journalism Foundation feels particularly relevant these days: ‘as journalism goes so goes democracy’. More than ever, it’s critical that current and future generations understand the role journalism plays in our democracy. With social media and an abundance of information on numerous platforms, the ways we consume and share news have fundamentally changed. We need to help Canadians better understand how quality journalism is produced and how to determine which sources of information are reliable. News literacy skills are essential to this process. 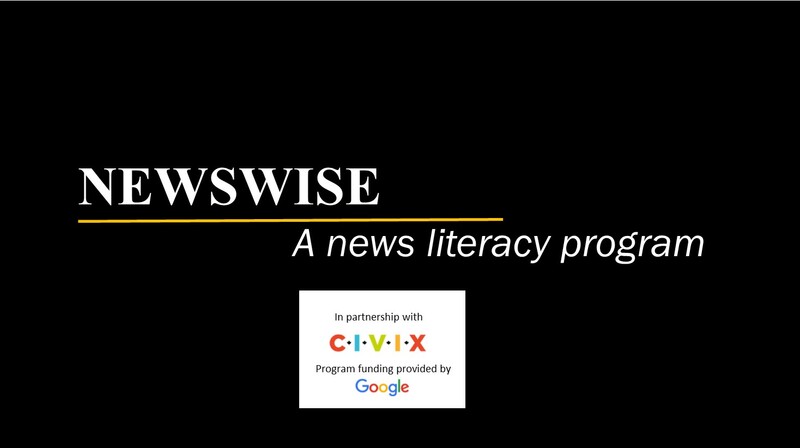 With a $500,000 grant from Google Canada, the CJF is thrilled to be partnering with CIVIX on NewsWise – a program to provide school aged Canadians with the tools and skills to find and filter accurate information online. The program will reach 1.5 million Canadians (ages 9-19) and the goal is to increase students’ ability to analyze media messages and expand their knowledge about how news is produced. NewsWise will be developed by CIVIX, the organization behind Student Vote, and CJF’s network of news leaders, journalists and academics. The program will be a part of the Student Vote activities, rolling out to coincide with the Ontario provincial election in 2018, and other upcoming local and provincial elections, culminating nationally nationally with the 2019 federal election. Student Vote already has programs in 98% of Canadian school boards. CJF will engage Canada’s journalism community in supporting the delivery of the program. The partnership between the CJF and CIVIX is built on the shared goal that that quality journalism in our country leads to a thriving democracy.